Cult hits are exactly that for a reason. They're movies that appeal to a small, feverishly loyal audience who, in most cases, love them either in spite of the fact that they're terrible (Rocky Horror Picture Show) or because they're terrible (The Room) -- or perhaps a mixture of both. Personally, I don't have a lot of time for movies that are terrible on purpose. Or terrible, period. I see plenty of them by accident -- many of them starring John Travolta or Nicolas Cage -- without actually trying to seek them out. These are not to be confused with guilty-pleasure films -- movies I enjoy against my better judgment or in spite of it. That's a category into which the films of Robert Rodriguez often fall. Not that Rodriguez couldn't make a serious film when he wants to. He just doesn't seem to want to very often. Or perhaps it's that the films he's serious about making are the type that are hard to take seriously. So it is with Machete Kills, the sequel to the raucous 2010 hit, Machete. Machete itself was a spin-off of what looked like a fake movie trailer from his and Quentin Tarantino's garish 2009 double-feature, Grind House." 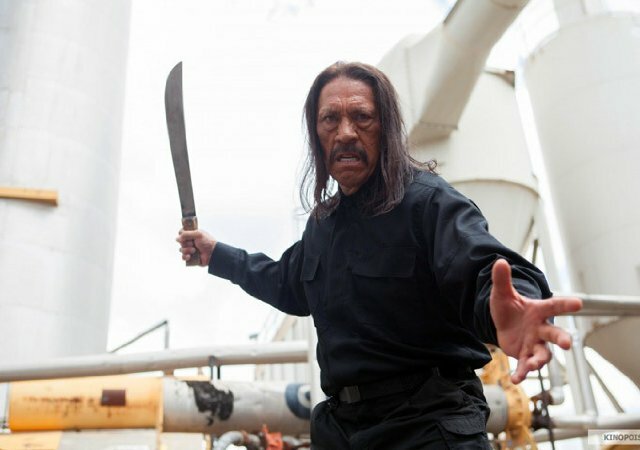 Machete, which turned veteran character actor Danny Trejo into a leading man, was a wild and wildly violent action-comedy, a spoof of exploitation films of the 1970s. So, obviously, is Machete Kills. How much of a spoof? It starts with a similarly phony-looking trailer for its own sequel, Machete Kills Again ... In Space! Then Rodriguez takes nearly two hours to build to a finale that ends with Machete being sent after this film's bad guy, Luther Voz (Mel Gibson, of all people), who has escaped into, yes, you guessed it, outer space.